Genius Chef 9-in-1 Cooking Machine. You’ll be cooking healthy and delicious meals for your family in no time. 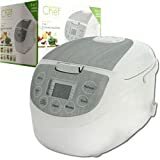 With the Genius Chef 9-in-1 Cooking machine you can bake, boil, fry, slow cook, cook rice/pasta, express rice, steam, stew and reheat! Cook up to four liters of food in a multitude of styles with the Genius Chef 9-in-1 Cooking Machine. You’ll be cooking healthy and delicious meals for your family in no time. With the Genius Chef 9-in-1 Cooking machine you can bake, boil, fry, slow cook, cook rice/pasta, express rice, steam, stew and reheat! This unique guide to preparing Indian food using classic slow-cooker techniques features more than 50 recipes, beautifully illustrated with full-color photography throughout. These great recipes take advantage of the slow cooker’s ability to keep food moist through its long cooking cycle, letting readers create dishes with far less oil and saturated fat than in traditional recipes. Anupy Singla shows the busy, harried family that cooking healthy is simple and that cooking Indian is just a matter of understanding a few key spices. Her “Indian Spices 101” chapter introduces readers to the mainstay spices of an Indian kitchen, as well as how to store, prepare, and combine them in different ways. Among her 50 recipes are all the classics — specialties like dal, palak paneer, and gobi aloo — and also dishes like butter chicken, keema, and much more. The result is a terrific introduction to making healthful, flavorful Indian food using the simplicity and convenience of the slow cooker. The Extreme Fat Burning Protein Diet Slow Cooker Cookbook (also known as The Extreme Fat Burning Protein Diet Crock Pot Cookbook) is available on Kindle or you can download it to your computer with Amazon’s FREE Kindle application for PC! Welcome to the exciting world of Extreme Fat Burning! The Extreme Fat Burning Protein Diet Slow Cooker Cookbook is a companion book to The Extreme Fat Burning Protein Diet For Men and The Extreme Fat Burning Protein Diet For Women. Imagine losing 5-15 pounds of ugly fat each and every week, week after week! Really! I guarantee it! How is this possible? It’s amazing! You will be turning your body’s metabolism from a sluggish, fat-making machine to a highly-tuned, revved-up fat-burning machine! The secret is to put your system into the fat burning mode of extreme ketosis-lipolysis. As an added bonus, you will discover how to lose even more weight with fat burning de-tox baths. If you are overweight, your body obviously doesn’t know how to regulate your weight. The problem is that your pancreas secretes too much insulin, which in turn, turns all your food into fat quickly and easily. You simply are not like the normal weight person with a system that regulates fatty acids and ketones to convert food into fuel instead of fat! Yes, it’s quite unfair but I have really good news for you! By simply limiting carbohydrates, fats AND calories from your diet, you will lose weight crazy-fast! You can expect to lose up to 10% of your body weight the first week and 5-15 pounds each and every week thereafter! If you weigh 200 pounds, you will lose up to 20 pounds the very first week! Get started today! Extreme Protein Diet Slow Cooker Super Simple PorkThe Extreme Fat Burning Protein Diet Slow Cooker Cookbook (also known as The Extreme Fat Burning Protein Diet Crock Pot Cookbook) is available on Kindle or you can download it to your computer with Amazon’s FREE Kindle application for PC! There’s nothing cozier than coming home from a busy day to the mouthwatering smells of dinner simmering on the stove and nothing more convenient than a meal that takes minutes to put together and then cooks itself. Slow cookers make sharing home-cooked family meals every night easier than ordering pizza and this healthy recipe collection from the experts at Woman’s Day will ensure those dishes are not only appealing and fuss-free but wholesome and nutritious as well. Slow cooking is not only convenient, easy and versatile but economical as well and novices and expert cooks will love these yummy dishes without worrying about the calories. This collection of over 50 recipes that have been triple tested by Woman’s Day will ensure that your meals are not only nutritious and low-fat but flavorful and tasty too. 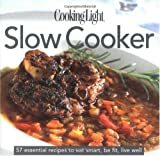 Perfect for the busy cook who’s short on time but values healthy home-cooked meals, all the slow cooker recipes in the book are organized by ingredient and include a variety of dishes using beef, pork, lamb, chicken, turkey and vegetables. Much more than just stews and soups, all of the recipes are healthy and low in fat and include cooking time, serving size and nutritional information. All you’ll have to do is set the table and serve! Beautiful to display and practical to use, Slow Cooker is truly a godsend for time-challenged cooks who want to prepare healthy, tasty, and satisfying meals but don’t have hours to spend hovering over their stoves. Replete with all the high standards that have made Cooking Light a trusted favorite, this new edition provides over 58 beautifully photographed recipes with useful, easy-to-follow instruction.